This weekend I managed three. Harry Potter and the Deathly Hallows, so good they split it into two films. Well… it was better than most of the Potter films (Azkaban being the best) though still a little too long. Also, and I only realised this after the film, it is dominated by Harry and/or his two chums appearing in nearly every scene, normally you bring in other characters if only for dramatic relief. I wonder if that’s really the case or my memory playing tricks? All will be forgiven if they address the balance in part two, but long emotional farewells will not be tolerated. 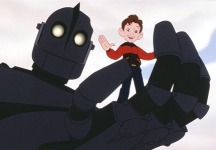 The Iron Giant on the other hand is a short film that could have been longer. Easily one of the best animations around, it may not have the technological marvel of a Pixar production but like that studio it understands that a good story is the key. However the worst film of the weekend - by far - was Goal! I can think of only three decent films on football. One is The Damned United, which I saw recently. Another is Fever Pitch, which culminates with a famous Arsenal victory over Liverpool; I remember watching that game and the Michael Thomas goal which stole the title away. The other film is Mike Bassett: England Manager, a none-too-subtle but very funny satire on the state of the English game; almost as funny as the running joke in Goal! where we’re supposed to believe in a Newcastle team challenging for a place in the Champions League. Comedy gold!